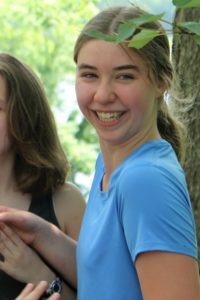 Allison Kinney is delighted to join the TPE staff after three years as a camper. She has performed at Traveling Players in Traveling Troupe, Shakespeare in Performance, and Classics in Performance, and several fall and spring acting classes. Last September, Allison was a director’s assistant the remount of The Blue Monster, and went on to be an assistant teacher for the Scene Study and Improvisation class. Offstage, Allison can often be found running around the woods of northern Virginia. She participated for several years in Ancestral Knowledge, an intensive wilderness survival and outdoor skills program, where she learned (among other things) fire safety, plant and animal identification, the principles of leave-no-trace, and (most vitally of all) how to recognize and avoid poison ivy. She also helped teach these skills to younger kids. Next fall she will be attending the University of Virginia, to study creative writing and literature.